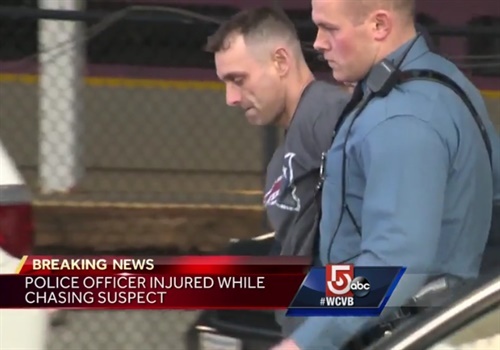 A bank robbery suspect who allegedly led police on a chase in Boston was taken into custody after being found in a portable bathroom, or port-a-potty, reports WCVB. Revere, MA, police said a man robbed a bank and fled in a vehicle with a little over $1,000 in cash. Police spotted a vehicle matching the description of the vehicle and initiated a pursuit. When the driver abandoned his vehicle, police said an officer crashed his cruiser trying to avoid striking the suspect. The officer suffered minor injuries and is expected to be OK. The chase ended in Boston's West End. Police said the officers were searching a parking lot by some porta-potties when they realized one of them was occupied. They said the suspect, identified as 41-year-old Steven Spolidoro, was hiding out inside it, and they took him into custody.